The above model indicates with great clarity six symmetries of the plane-- those it shares with the equilateral triangle. It does not, however, indicate where the other 162 symmetries come from. The cubes' partitioning planes are added in binary (1+1=0) fashion. Three partitioned cubes are collinear if and only if their partitioning planes' binary sum equals zero. The second model is useful because it lets us generate naturally all 168 symmetries of the Fano plane by splitting a cube into a set of four parallel 1x1x2 slices in the three ways possible, then arbitrarily permuting the slices in each of the three sets of four. See examples below. For a proof that such permutations generate the 168 symmetries, see Binary Coordinate Systems (July 1984). For a check of the proof, see a MAGMA calculation. For some illustrations from 1984, see Diamonds and Whirls. For a popular presentation of such permutations (with no acknowledgement of sources) see "The Cube Space," by Laszlo Lovasz et al., pp. 215-216 in Discrete Mathematics: Elementary and Beyond, published by Springer on Jan. 27, 2003. The above arrangement of the seven cube-partitions is that of the traditional picture of the Fano plane, with points as dots replaced by points as cube-partitions. The following is another view of this replacement. of linear 4- or 6-spaces over that field. Baez's statement that "lines in the Fano plane correspond to planes through the origin [the vertex labeled '1'] in this cube" might be taken literally by some viewers of the Baez slides, with the planes regarded as cutting a cube in Euclidean 3-space. So interpreted, the statement would be false. But this is not what he meant. That projective-plane lines correspond to planes through the origin in linear 3-space-- a standard definition of lines in projective geometry-- is trivially true both of the Baez cube and of the eightfold cube (Fig. 5 above). 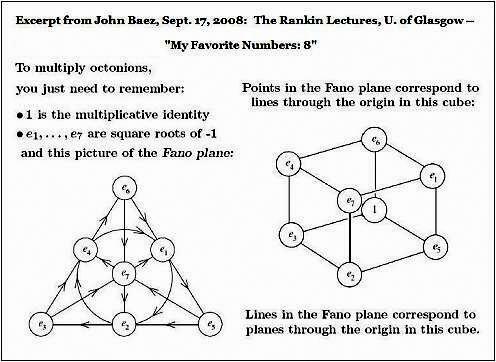 Lest viewers of the Baez lectures confuse his remarks on the Fano plane and the cube model with my own remarks on the same subject, it should be emphasized that the point of the eightfold-cube model is-- unlike the Baez cube-- to exhibit the seven projective lines not as planes through the origin, but rather as sets of partitions of the eight subcubes (Fig. 3 above). This allows group actions on the space to be visualized as generated by simple permutations of 1x1x2 cube sections (Fig. 4 above and Diamonds and Whirls). Although it is not a figure from Euclidean geometry, the eightfold cube (a Galois geometry) may be modeled by a concrete, palpable (Fig. 6 above) physical structure whose natural transformations are, unlike those of Euclidean geometry, non-continuous. As such, it may eventually, as Euclidean geometry has in the past, throw some light on the structure of the space we live in. To view the cubes model in a wider context, see Galois Geometry, Block Designs, and Finite-Geometry Models. For another application of the points-as-partitions technique, see The Diamond Theorem and Latin-Square Geometry: Orthogonal Latin Squares as Skew Lines. For more on the plane's symmetry group in another guise, see John Baez on Klein's Quartic Curve and the online book The Eightfold Way. 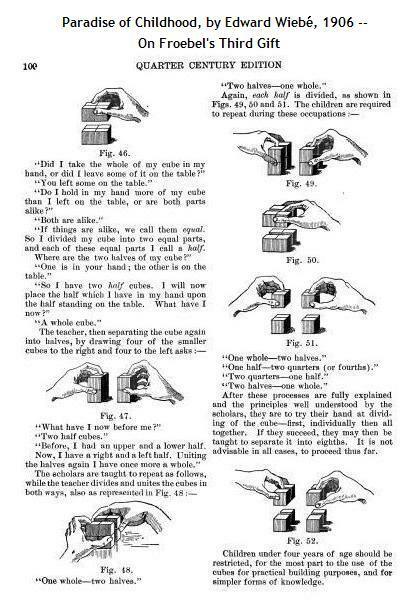 For more on the mathematics of cubic models, see Knight Moves and Solomon's Cube. Page created May 4, 2005. Last modified July 30, 2011.